The reason Aamir Khan trumps all other stars in Bollywood is because he does not hesitate to do unconventional roles. He is not really bothered about his image, his stardom or his fame. He does not insist on hogging the limelight either and keeps his role to a bare minimum of what his character in the movie requires. We’ve seen this in “Taare Jameen Par”, in “Dangal” and now in “Secret Superstar” as well. And hence though Secret Superstar is an out and out commercial film, Aamir Khan is not the star. He lets the main characters of his films be the stars once again, and plays the supporting role so brilliantly, that he will of course be remembered as much as the stars and lauded multiple times over! 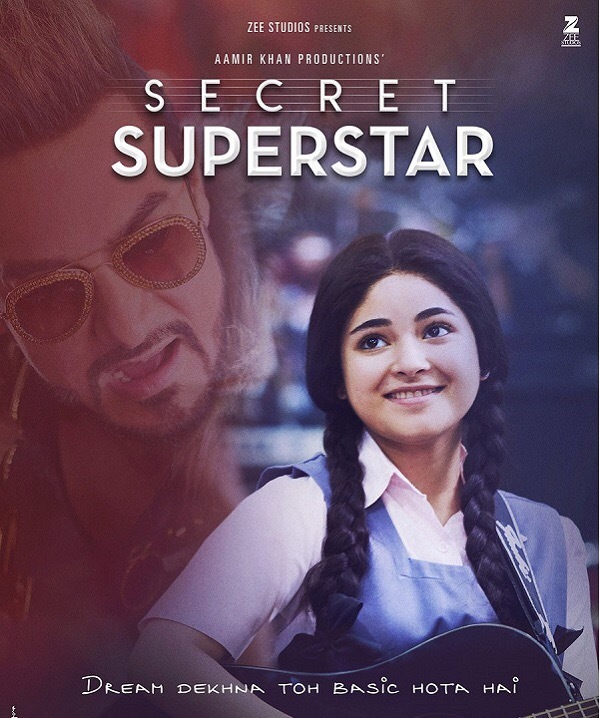 So Secret Superstar is a story of dreams and of fulfilling them. Of making your own path and not letting destiny run your life for you. Of tackling odds head on and not letting negativity ruin your ambitions. Most of all, it’s a story of hundreds of (especially) girl children who can dare to soar high in the sky because their mothers are their firm anchors on the ground. It is a story which shows that women of strong characters and mettle are not built by high education, financial independence or feminist views only – that women of strength are built by a desire to give their own selves and their children wings to fly and the courage to be their own masters. It is the story of little Insiya, on the verge of youth – a child and yet wise beyond her years, and her illiterate yet strong mother who faces and tackles the abusive and dogmatic father to finally make a break from him in order to give her children their own space and allow them to chase their own dreams. It is the story of a mother who has the gumption to bring a girl child against all odds into the world, nurture and cherish her and her talent and take a drastic step in leaving her husband in spite of being illiterate, penniless and jobless to ensure that the child and her dreams are not sacrificed at the altar of religious, caste or gender dogmas of the world. It is also the story of an over-the-hill, arrogant music producer/director who needs a magical voice of little Insiya to bring him back his fame and salvage his “spoilt brat” image for him. Her melodious voice and intrinsic understanding of music finally bring out the “heart-of-gold” which he hides beneath his arrogance and rudeness and catapult them both to fame. The movie has some soul-stirring music in the songs sung by Meghana Mishra and written by Kausar Munir. Beautiful lyrics and beautiful tunes, and a strong yet melodious voice which carries them well. The performances of all the characters are brilliant; the abusive father, the loyal and trustworthy friend Chintan, the impish and loving younger brother, and most of all the mother Najma and the daughter Insiya played by Meher Vij and Zaira Wasim respectively do full justice to their roles. The chemistry and understanding between the mother and daughter bring a tear to the eye on many occasions! Zaira Wasim’s expressive eyes and body language convey all her moods beautifully. And last but not least, Aamir Khan as the music producer! The over-the-top, women-ogling, yet sensitive, empathetic and for Insiya almost a father-figure-like celebrity is portrayed effortlessly by him. His is an award-worthy performance all the way, once again! Don’t miss this one, for the message it conveys, for the story (which is simple, yet well-told), as well as for the performances! A rating of 4.5/5 is what I would give without hesitation! Previous Previous post: A teacher’s heartfelt vote of thanks! Next Next post: FaFe aka Faster Fene…the 60-year-old young sleuth!